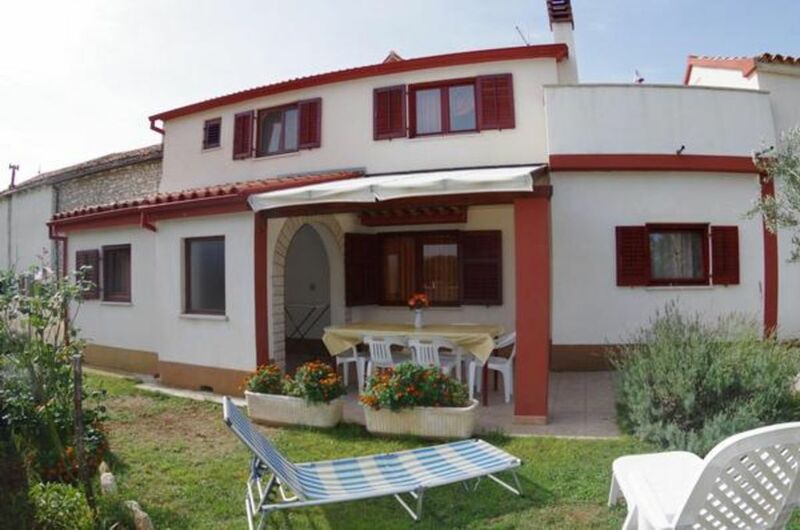 Spacious 2 bedroom apartment in the village Dobrani on the southeast side of the Istrian peninsula. Located in the green surrounding,covering 400 m2 of the yard, away from crowd and hustle, this affordable apartment is good choice for peacefull family vacation. You can enjoy warm summer evenings with barbeque dinner while children are playing on trampolin within the fenced garden . The aparmtent is located on the ground floor with exit to the shaded terrace. The inside of the apartment is simply,but funcionally furnished, offering 80 m2 of the living area. The closest beach is within 2 km reach. There are nice local taverns and inns in the area, locals often sell homemade products like olive oil, figs, wine .. If you feel like changing the amtosphere and experience summer excitement of the busy streets, the city of Pula is 25 km from your house. The cultural events, fairs and festivals, taking places on open squares and colourfuul streets are nice evening choice. Your children will probably appreciate daily visit to Acqualand or Dinnopark which can be easily reached from your vacation home. The owner lives in the same house .